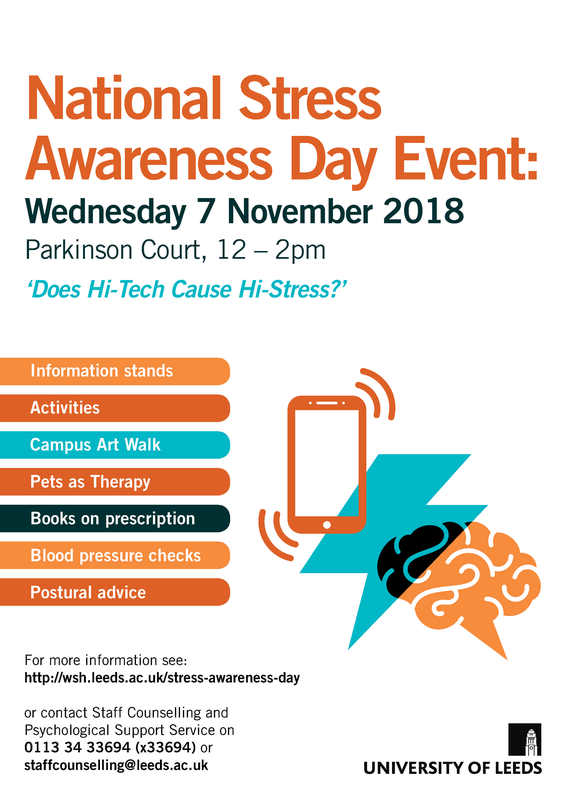 All staff are welcome to attend an event for National Stress Awareness Day from 12 noon – 2pm at Parkinson Court, Wednesday 7 November. UNISON University of Leeds will also be running a stall at the event which is being coordinated by the University of Leeds Staff Counselling and Psychological Support Service. SCPSS – 15 minute Mindfulness Taster Workshops with Sally Rose at 12midday, 12,30pm, 1pm and 1.30pm – book a place by contacting Yvonne on y.a.bell@leeds.ac.uk or just drop in on the day. SCPSS – 10 minute Qigong Taster sessions with Marcus Hill a 12.15pm, 12.45pm and 1.15pm – book a place by contacting Yvonne on y.a.bell@leeds.ac.uk or just drop in on the day. Stress affects us all at different times and in different ways. It affects us most when the demands and challenges in our work and lives exceed our personal and social resources to keep our balance. 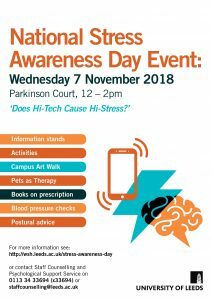 This year’s National Stress Awareness Day theme explores the question “Does Hi-Tech Cause Hi-Stress?” and considers whether technology might help with or contribute to our stress levels both at and outside of work.